Originally posted as a blog post February 2012. Something that I have been learning more about has been dreams. Recently, a student from my school Michelle A., wrote about dreams in her post, “Do I have Abnormal Dreams?” I learned a bit because like she says it’s a very complex study. 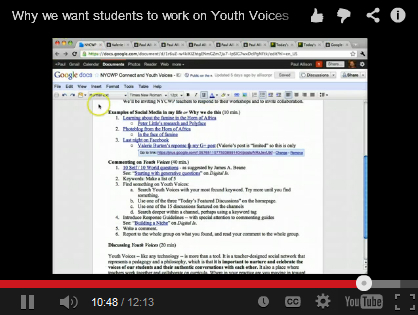 Many other students have also written about dreams on Youth Voices. And she makes further connections to other sources in her own research, some of which is summarized in a link at the bottom of her essay. One final example is a bit different. Misty has been working on an open-ended, amorphous inquiry about cruelty or corporal punishment or something. Here’s one of her reflections on her questions. Yesterday she asked me if she could change her question, and when I asked her why, she said it was because of the amount of conversation that was generated when she just had to spill about something that was going on in her personal life. First she had to write it, and she deeply valued the give and take in the comments at the bottom of that uncorrected freewrite. The next day, Misty was ready to talk about these issues on a video. And now, she is clear about her topic for research and writing, and she’ll be posting about it before Wednesday. So here are three examples of students, Evelyn, Michelle, and Misty, who are learning in connected ways. Please feel free to connect to any of these conversation yourself! We welcome your comments.